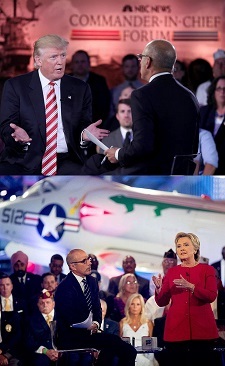 Hillary Clinton and Donald Trump appeared back-to-back in an NBC "Commander-in-Chief forum", moderated by Matt Lauer, on Sept. 7, 2016, taking questions on foreign policy and military topics from the audience. We re-arranged many of the candidate responses into a "debate" format, as if the two candidates had been on stage together. In fact, they were not, although sometimes they did respond to the other's comments(just a half-hour later). The mainstream media billed this Forum as a precursor to the actual debates, beginning at the end of September. Donald Trump: Russia wants to defeat ISIS as badly as we do; work together. Donald Trump: Create V.A. mental health division to reduce veteran suicide. Donald Trump: Let vets see private doctors or VA: that's not privatization. Donald Trump: Create a military court system to deal with sexual assaults. Hillary Clinton: Move V.A. into 21st century, but not by privatizing. Donald Trump: We've been badly hurt by Mexico both at the border & on jobs. Donald Trump: I beat 16 very talented people in the primary. Hillary Clinton: Mistake to use personal email server at State Department. Donald Trump: When we defeated Iraq, we didn't know what to do after that. Donald Trump: Current leadership hurts military; need change to beat ISIS. Donald Trump: I would be slower to go to war than Hillary. Donald Trump: I opposed Iraq War in 2004; it destabilized entire Mideast. Donald Trump: 2011: Knock out Ghadafi; 2016: Libya war was a mistake. Hillary Clinton: Iraq war VOTE was my mistake; Iraq WAR was Bush's mistake. Hillary Clinton: Libya war, with full coalition, prevented massacre. The above quotations are from Joint appearance at Commander-in-Chief Forum, Sept. 7, 2016, moderated by Matt Lauer of NBC News.